This annual Empty Bowls event is always a fun time to see friends and neighbors, choose a gorgeous handmade bowl and enjoy a delicious bowl of soup and some bread from the Silvercreek chefs! Hope to see you there! Proceeds benefit Daily Bread Soup Kitchen. We soup kitchen volunteers are always looking for ways to tell the Daily Bread story because we believe so strongly in what we do. The Daily Bread Speaker’s Bureau is a corps of eager, enthusiastic volunteers who are available to speak to organizations about Daily Bread. We are willing to go to any group that would like to learn more about the issue of hunger in the CU community and what Daily Bread is doing to try to combat this problem. If you are a church, school or social group who would like to hear our story, please contact Karen Pickard at kkpickard@gmail.com for more information. It’s backpack time again at Daily Bread, and we hope that many of you take this opportunity to be Santa this year and provide a bit of Christmas to one of our guests. We will celebrate the holidays by giving filled backpacks to the men and women who are our guests at lunch. The men and women we see daily are rarely remembered at Christmas. For many, these backpacks will be their only presents. Backpacks will be given away on Friday, December 14, beginning at 10:00 a.m. Last year we gave away over 800 backpacks. We’re assuming that we will need that many or more this year. Backpacks should be stuffed with toiletries such as deodorant, hand lotion for hands chapped by the cold, toothpaste, toothbrushes, shampoo, shaving cream, etc. Cold weather items such as gloves, hats, scarves, socks, sweatshirts, tee shirts, long underwear, and regular underwear are especially appreciated. Other items could include hand warmers, cough drops, books, decks of cards, small fleece blankets, candy, gum, and food items. Since the backpacks are a Christmas gift, all items should be new. All backpacks should be new or nearly new as well. In the past we have found used clothes in packs, which we donate to Goodwill. All backpacks should be labeled with the gender and size of the recipient (i.e., Man-XXL, Woman XL). We found last year that most of our guests requested at least a size Large; most preferred XL. There is also a need for some 2X and 3X bags. We will NOT be giving out children’s backpacks this year. Filled backpacks can be dropped off beginning Monday, Dec. 3. Backpacks can be dropped off at Daily Bread, 116 N. First Street, Champaign, during the week from 9 a.m. to 12 P.M. Please use the back door on the alley when dropping off backpacks. Backpacks can also be dropped off at Ellen Harms’ (705 S. Elm Blvd. 356-2551) at Pam Hagle’s (713 S. Elm Blvd. 359-3245) or at Ruthann Evans’ (4414 Crossgate Dr. 398-5687). Tax forms will be available. We are also happy to accept empty backpacks and also items to fill backpacks. Filling one or more backpacks can be a wonderful holiday project for a family, grandparents, a scout troop, social club, tennis group, neighborhood friends, book clubs, etc. Daily Bread Soup Kitchen provides outreach assistance to our guests in a number of areas. Birth certificate and ID application day is the second Wednesday of the month from 10:30 a.m.- 12 p.m. Annual Bus Pass applications are taken twice per year. The date is not publicized ahead of time but regular guests will be aware of when it takes place. Local agencies come to DBSK on a regular basis to provided information and referrals to our guests. * Application for SafeLink phones. * Housing stability-focused service delivery program for very low income Veteran families throughout central Illinois. * Serves Veteran families that are homeless or imminently at risk of being homeless. * Provides on-going support, as needed, to sustain independent living. * Provide information on SNAP/Link cards and Food Stamps. In addition to providing a daily meal, as our funds allow we also try and help guests in other ways. Assistance Days are held the 2nd Wednesday of the month. At that time, guests may apply for a State ID and/or birth certificate, both in-state and out of state. This identification is necessary to receive public assistance, enroll children in schoolOutreach or to find a job. Twice a year, we buy yearly bus passes for guests who demonstrate a need. We believe that providing a person with a year’s worth of transportation for $84 is money well spent. We also advocate for our guests at local agencies. Food Donations can be dropped off at the alley door of DBSK, at 116 N. First Street, Champaign, between the hours of 8 a.m. – 1 p.m. seven days per week. We gratefully accept fresh fruit and vegetables as well as canned goods and frozen foods. All donated prepared food must be made in a Public Health Approved kitchen. Meat must have been processed in an approved meat processing plant. Eggs can only be accepted from a certified source, such as a grocery store. A person who sells eggs elsewhere must have a label on the cartons showing that the eggs are approved by the USDA. In order to continue our mission of feeding the hungry, Daily Bread needs an income stream that is reliable and sustainable. 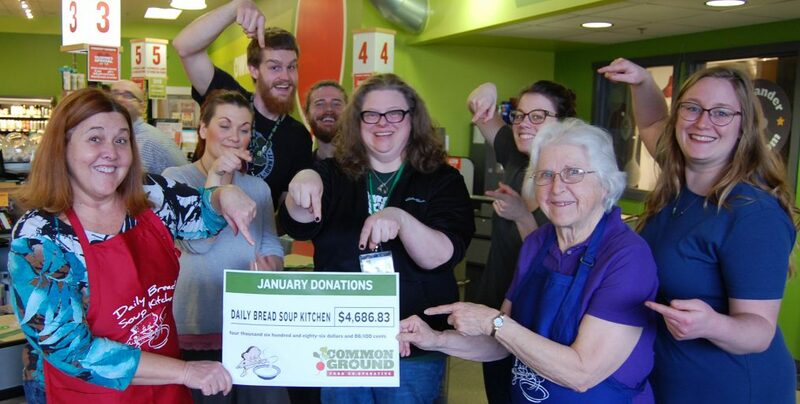 For many years, St. Jude’s Catholic Worker House Soup Kitchen was sustained by its “Ten Dollar a Month Club.” Month after month many loyal supporters (including many of you who are reading this and followed us to Daily Bread) sent in checks that kept the bills paid, the pantry stocked, and the oven hot. Now, with the “Bread of the Month Club, ” you make a commitment of whatever is comfortable for you, be it $10, $20, $50 or more per month. Once you join we’ll send you a profuse thank you, but we won’tBread of the Month Club be sending you monthly reminders or envelopes. For more information contact our treasurer Stevie Bennett at Katie983@aol.com. Anne Frank wrote in her diary, “How wonderful it is that nobody need wait a single moment before starting to improve the world.” Please don’t wait. Join Daily Bread’s Bread of the Month Club today.